Kim		All right, we are going to do a quick legal session because I have a little bit under an hour. Basically the only thing you are going to learn for right now, which is pretty much the first thing you need to know, is it soap or is it something else, because it could be any number of things. So there are a multitude of laws. We are in Florida. Derek took a poll last time while I was here and they said Florida, not Federal. So today, we are doing Florida. Alright, so keep in mind these rules are for Florida. If you’re working elsewhere, you will have to look at the law of that state and see if definitions are the same because they could be different, and I’m glad Kevin is staying because he is going to help me with a couple of things when we get to some definitions. He can explain some things to you that I don’t know, I’m not a chemist, I don’t understand most of what he was talking about. Well this controller isn’t working, so I’m going to have to have my back to you a little bit. It isn’t functioning like it is supposed to do. So if it is not soap, it’s going to be a cosmetic or it’s going to be a drug. Those are your choices in Florida, you’re a drug, cosmetic or soap. Now that’s my name, my e-mail, it’s in your materials, you have a print out right? So Florida’s governing law is called the Florida Drug and Cosmetic Act. That is actually what it is called, the name of it, you call a government agency and tell them you want to ask questions, you want to ask questions about Florida Drug and Cosmetic Act. It is actually written down, you can find it, it is in the Florida Statutes. All of our laws in the State of Florida are called statutes. Some states call it different things, in Florida we call them statutes, it is called the Florida Statutes, it is divided by titles and chapters and sections and paragraphs and subparagraphs and you know how lawmakers become, there are subs, and subs and subs and subs. What you need to remember is Chapter 499. That will get you there. You go on Google, Florida Cosmetic, Chapter 499, it will get you there. You can go to MyFlorida.com. That is an official web site for the State of Florida where you can find almost everything you would want, as someone that lives in Florida. You can find out about real estate taxes, you can find a list of the counties, you can find the list of the courts, you can find for the Department of Revenue and go on to your child support account, all kinds of things like that for the State of Florida. That’s where you can get your applications to apply for benefits, if you were going to register a cosmetic or a drug here in Florida. You could go there to find the registration forms and a governing agent for that. So remember, MyFlorida.com. It’s a great place for the State of Florida anything about the government and its rules and laws. Now to actually read what’s in it, you’ve got to get there, so MyFlorida.com you have to actually get to the statutes and to get there they have some kind of subpage, I’m sure your technical people, Mike and Derek, can tell you more. All I know is it is a sub of MyFlorida.com and it’s Online Sunshine. You can get there a couple different ways. You can either put into their little search box in MyFlorida.com, they have their own little search box like Google, Yahoo, Bing and just put in Online Sunshine and it will take you there and you will see a list of the statutes; or you can down and pick your different parts of the State of Florida government agencies that you want, just go pick government, pick the legislative branch, (you know that’s Congress for Florida, we have Congress as well), and look up Florida Statutes, a little link that says Look Up Florida Statutes. Just click on it and you are going to get to a list and they make this convoluted, you know that’s why we go to law school and we actually take a year’s worth of learning how to look this stuff up, believe it or not. What you need to remember is it is Title 33. You can’t find 499, you have to get to the title that 499 is under. It will not tell you that, there is no list anywhere, so that you know, 1 through 125 is Title I. There is no list like that, nobody has ever made it, it’s not there. Just remember, it’s 33, Chapter 499 is under Title 33. They are always in Roman Numerals. You won’t see it any other way. Kim		Okay, so what we are going to do, is given what you know right now as you sit here before I tell you any of the legalities about soap, cosmetic or drug, let’s get you to figure out if it is soap or is it a cosmetic, or is it a drug. So go through them one by one, there is about ten. Grandma’s Pure and Natural. Those are pictures of everything on the bar of soap. That is the packaging. Just write down on the form, just pick if it is a soap, a cosmetic or a drug. Just take a look at all the labeling and you are not meant to spend long doing this. Go on to Grandpa’s Baking Soda Soap. Go on to Hair & Body Therapeutics. There’s not much on that to look at. Then you get Bright Starts. I gave you a little collection of products for you to test you. What about this one, Shea Moisture. Busy busy label, lots of stuff on it to look at and read. This is a melt and pour. This is all the labeling that is on that melt and pour, I think it was two pounds, yeah it says two pounds. Another melt and pour called Soapsations. This is a bar of soap Tea Tree Therapy. Take a close look at Tea Tree Therapy, it’s a trick. Here is another melt and pour, honey from Crafter’s Choice. That’s the only label. Another melt and pour from something called Liquid Gold. Another melt and pour called Stephenson Personal Care. So in Florida, the agency for the State of Florida that’s responsible for enforcing it, which was a little bit of a surprise to me, is Florida’s Department of Business & Professional Regulation, they call it the “DPR”. So, if you’re a barber, a cosmetologist, you get a license for that. These are the people that regulate these licenses, okay? So if you want to make cosmetics or make drugs and you need a license, you go to them. There are also the ones that are going to regulate your soap, even though you don’t need a license to make soap in Florida. You don’t need a license. How do they regulate you for soap? They don’t. If it is something other than soap, you have to register and they get the right to come out and inspect. Inspect your facilities, you have to submit labels to them and they check it all out. If you don’t allow them, if you aren’t making soap, and you have to register with them, you are agreeing that they can come and inspect and it is an offense, even a criminal offense, if you do not allow them and fines can be severe. Now we’re not talking about cosmetics today, so we are not going to get in to how much they can be, but fines can be severe. Right now today, you are making soaps, we are dealing with soaps. Now, I spent multiple, multiple hours, almost a week’s worth, I could not find one case, one instance where the State of Florida had gone after anyone that made soap in Florida. I couldn’t find one. I called the agency asking, they were going to have the attorney talk to me. I have called them three times and I haven’t gotten a response. But, the secretary for the attorney, didn’t know of any instance. She said “Yeah we would like to know if there are any. We don’t find any.”  So that’s the good news. It is going to be very easy by the time you’re done with this. It really is simple, you just have to understand where it comes from that it becomes so simple. Do not make it more complicated than it is, okay? In Florida, you’re a cosmetic or a drug, or you can be soap. There really isn’t a definition for soap, not really. There is no definition in Florida for soap. Soap is exempted from cosmetics and drugs. In Chapter 499 is for cosmetics, drugs and medical devices and that’s what controls soap. But, if you want to look at 499, it will give you a definition of cosmetic and here you go, and it is in your materials, so you will always have this. This is the Florida definition: “It’s an article with the exception of soap.”  Very first sentence of defining cosmetic “except soap”. That is, here’s your definition if it’s a cosmetic. We’re dealing with soap. All you need to know is if you’re not having your soap being intended to do any of those things, and they got quite a list, I was surprised, “Intended to be rubbed, poured, sprinkled, sprayed on; introduced into or otherwise applied on the human body”,  and that’s what you do with soap, right? Kim		“Or any part for cleansing, beautifying”. Come on, how do you define “beautifying”. I can see why they don’t enforce anything in soap. “Promoting attractiveness”, well you know this is all subjective, or altering the appearance. On the second part to the definition or “intended for use as a component of an article that does any of that in it”. But remember, that’s if you’re a cosmetic, that’s the definition if you are a cosmetic, soap is not any of that. So let’s try to break that down a little bit. What is soap? I said Florida doesn’t define it. But Chapter 499, every one of the Florida Statutes when they start a new chapter, they tell you the first thing .001 to .0011 or 115, it depends on how many variations of it they have, they tell you the name of it. That’s where we get Florida’s Drugs and Cosmetic Act, they tell us that is what it’s called in the very first little section, kind of like a preamble, but it’s not, it is its own little section, and a couple sections later you get the definitions and that’s where cosmetic comes from. In between those, it tells you what the intent of this whole Act, it tells you why the legislature did this Act and it tells you the purpose of the Act. Intent and purpose are kind of the same, the purpose is the reason they did it and the intent is what they intend it to regulate in this case. So in this case, they said that their intent is to get rid of some of the confusion with all the Federal law and how they interact with states. So they merely said they intend to combine and make uniformity and conformity of the laws by the Federal Food Drug and Cosmetic Act, which surprising to me is actually under the Department of Health and Human Services and the Federal Trade Commission. They define soap. That’s where our definition of “soap” comes from. I would think for other states other than Florida that unless they say a different definition in soap that they are stuck with the same definition. So, let’s see how the FDA defines “soap.”  This is where I’m going to use Dr. Dunn. He’ll like this, he’ll help me because I don’t understand a lot of the science, but it’s not science if you just kind of understand “The bulk of nonvolatile matter in the product consists of an alkali salt of fatty acids and the product’s detergent properties are due to the alkali-fatty-acid compounds”. Double Dutch to me. And second component is “labeled, sold and represented solely as soap” in that Federal law. It’s easy, don’t complicate it, they’ve got you through all of this. They’ve got you referring to all these things. I’ve done it for you. So, let’s talk about these two components. Let’s break them down and I did it in my legal way terms and Dr. Dunn’s going to help you understand because some of this stuff he said today goes right into the definition. He’s shaking his head. He sees it already. So let’s break it down. What does it mean to be the bulk of something? The BULK. According to Webster:  the most of something, the largest part. So the main ingredients, and that doesn’t mean that it’s the first ingredient because it’s 10% and everything else is under 10%. No, remember it’s the bulk of the product. So it is the vast majority of what your product is made of. What is the nonvolatile matter. What’s nonvolatile, Webster says it’s just not volatile. My understanding is basically it means it’s not active anymore. Kevin		No, it means that it doesn’t evaporate. Kim		It doesn’t evaporate? Is that what it means? Kevin		For example, if you make a liquid soap, say we’re not talking about water, we’re not talking about that part, we’re talking about the stuff that doesn’t evaporate. So it would exclude water and alcohol probably would be the only ones exempt. Kim		Most cosmetics have water or alcohol, which breed, water breeds what? Kim		Right bacteria. That’s why it’s regulated. Alkali Salt of Fatty Acids. This is science above me, but I do know from my research and what Dr. Dunn was saying this morning, that basically that is the soap. That is your fat with your lye, exactly how he is going to use lye this afternoon. Caustic soda mixed with your liquid so that you have a solution (a liquid solution} that you are mixing with the fat to saponify. That is your soap. The other stuff you add to it is all fine. Detergent Properties	Here is another issue. It’s actually discussed some and what’s led up to the passing of all these laws, including the FDA, and that’s because most of the soaps out there these days, the commercial brands, they aren’t really soap. They get their cleaning properties from synthetic detergents. So that’s why they said they’re detergent products. That’s why it says in the detergent properties which are the cleaning properties of the soap, its ability to actually clean, break down the dirt and oil that you want it to break down, comes from that alkali fatty acid components, which again is basically the soap. Alkali-Fatty-Acid Components 	Don’t really ask me the difference between that and alkali salt, they are all the end result of a chemical process of your lye solution with your fat to make it soap. That’s all you need to remember. Is that basic enough, Dr. Dunn? Basic enough for whether you meet the definition of alkali-fatty-acid components. If they try and say you’ve done something different, as long as you can show them you’ve used your sodium or potassium hydroxide with your liquid and your oils and that’s the bulk of your ingredients in Florida, you’re a soap. The second. Labeled, sold, and represented solely as soap. Now you can move forward and look at what I gave you for C.F.R. 21, Subsection 701.20. CFR is another set of Federal laws. They are not statutes. What happens is Congress makes a law. An agency is responsible for enforcing it, but the agency doesn’t know how they’re supposed to enforce it. So there is a whole series of books, I can’t say a book, it’s called the Code of Federal Register [sic:  Regulation], because it’s a register of all the Federal rules and regs that tell these agencies what they have to do to regulate these industries and they come up with the definition and you see it in your materials if you go another two pages and basically you have already read that haven’t you? You’ve already seen it,  you already know what that means, and if you’re making soap and conforming it with Florida’s laws, you already comply with that, so you don’t have to worry about being solely as soap under 21 C.F.R. 701.20. The words are identical, so what Florida already uses, the FDA definition, it’s already identical. So let’s look at labels. Remember you can take any product you make, out of the category you intend it to be if you misrepresent it and you can misrepresent it in any number of ways. Labeling is one way, so you have to be very careful what you put on the label and how to say it. Now beware, in all of my research, although I didn’t find anything that enforces any of these rules against one soapmaker in Florida, I found absolutely nothing and the Department of Professional Regulation could not tell me anything because that was one of my questions, but they didn’t know of anything. Just remember labels include everything. So if you have more than one web site to help boost your sales, you’ve got Face Book, YouTube, Twitter, your web site on which you sell it, you list it on Amazon, E-Bay, Etsy, can’t think of the other one, Artfire, you start doing all of that, you need to make sure that you don’t take your soap out of being soap by the claims you make in all that, because all those things are considered. The worst case that I thought I found was nothing to do with soap, it was with a prescription drug by an actual doctor. He owned a bunch of different corporations, his wife owned some, him and his wife were shareholders in other corporations, one of which (that his spouse was the sole owner of) did a brochure that the government deemed to be completely misleading about this diet drug that being done. They shut it down, he actually ended up getting criminal charges and going to prison because of the commonly owned entities rule that the IRS has for purposes of whether or not you are actually representing something about your product, you have to consider what you would let say your spouse, if you have your minor child owning the site that you put up thinking that would get you out of it, it doesn’t work. They’re going to look at that. All that is considered advertising. Now you can’t control what people say when they buy it from you and resell it, that’s different. They are just looking at what you have control over. Sold, it specifically says in Chapter 499 that includes drop shipments. So if you have someone say Essential Depot selling your soap for you,  you make it, they take orders, send them to you and you ship it directly to the customer, but the sale is from Essential Depot, that’s you selling it, that’s you selling soap, that’s not giving your soap to your friend. That keeps you under the laws and you need to make sure you comply. Offers to sell. If you’re bargaining, and you give them soap, basically it ends up being on consignment or “if you sell it then you pay me,” those kind of offers to sell, those are sales. That’s what they say, they are sales. Giveaways. If you give away exactly what you sold, what you sell, and they did just make it, this soap here, you sell it, but if you also gave it away that means the giveaway is regulated. Soap that the labeling would be regulated. However, if you did a different size, say a hotel size, and that’s the one you gave away, different, different product, different size, different quantity, it is that simple, believe or not, I was surprised at that, but it is. Now, you know why you have those little hotel bar pictures, right? Represented. I pretty much talked about that when I said what you allow to go out about your product from things that you have control over, your label, your literature, your packaging, all that stuff is considered. It includes for instance, what sales reps, if you have a big company and you have sales reps going out and saying things, what they say you are bound by. In Florida you are bound by it. You already saw the 21 C.F.R. 701.20. You now know when you see those numbers you already know what it is in Florida and you can ignore it, you comply. You know what it is, it is the same definition, you are already familiar with as a cosmetic, and it exempts soap. Now, I gave you two portions of the chapter just so that you would have them at ready’s glance. I can’t tell you when they’re going to be changed. All I can tell you is right now that’s what they are. So I gave you advertisement because, of course, that’s your representations. Labeling is advertising. They are simple, it’s what I told you. Just anything you lay out to the public to your customers is your labeling and representations and how you intend it to be used and remember intent is part of how you define it. And there is the 21 C.F.R. 701.20, you can find it if you just run a google and put it in like I typed it, it would come up. You would probably wouldn’t understand it. There is a lot more, I mean these things can be 12 - 100 pages long with 500 terms and definitions   I pulled out the couple that you need to know. Michelle		I know what soap is but labeling I don’t know. Kim			Okay, you look, exactly, what is it? Kim			Did you hear her, she said it doesn’t say what they’re making it out of, so is it a cosmetic, yes. They didn’t say, it gets sold under cosmetics because they don’t know what it is, so they are going to give you the higher regulated item. If they don’t know what it is, they are going to say you’re the higher regulated item. Pay attention to some of the ingredients. Kim			Remember, do not over complicate it. Your basic soap, as long as that’s your bulk component and as long as it hasn’t been misrepresented on the label, because that’s all you have there is labeling, you don’t have any internet advertising that goes with it, I didn’t even go there. Yes you know what soap is, don’t worry if you know if it’s a cosmetic or a drug, you know if it is soap or not. Did you understand her questions? Did everyone hear her questions which were very good points for you to understand. Tell them what you just said. It was very good. Corinthia		Well you know the ingredients may comply with soap, but it’s making a medical claim so it’s not soap. Kim			Right, forget about whether you know it is a cosmetic or a drug, you’re not a drug manufacturer, you don’t make drugs, forget about whether you know that. You know it’s not soap. Corinthia		Right, but it’s considered as a cosmetic or a drug. While you were talking I was looking up the laws in Maryland. Kim			It could be, I don’t know what Maryland’s laws are. You probably have the same definition of soap would be my guess. Corinthia		It also broke down saying that the difference between a cosmetic and a drug, it just said that it is going to help like a dandruff or something like that, then consider it has both cosmetic and drug. Vita			Even if no ingredients lists, it’s a cosmetic. Kim			Yes, we have the same thing in Florida. But for today’s purpose, you are just looking to figure out from looking at the labeling and the ingredients is it soap and therefore you don’t have to register and be regulated as someone making and manufacturing and selling cosmetics or drugs. Kim			It’s making itself a cosmetic or drug? Kim			No, they won’t come after you for making soap, they will come you saying this product is regulated as a cosmetic. Because you can have soaps that are drugs, there are soaps that are designed to do specific things that are regulated as drugs. You can put chemicals in them that do specific things and you need a prescription to buy those. Mary			For instance, they say you put on there lavender and whatever else and this therapy will cause relaxation and all that, is that considered cosmetic? Kim			If you told people what it is intended to do for them, then yes. You can list those things in your ingredients and you’re fine, but when you start saying what that soap is intended to do; remember I was specific about the intent, that’s one of those components. You start telling them it is intended to do these things that are other than the detergent properties of your alkali salts and fatty acids cleaning you, you’re out of soap period. It doesn’t matter that those things are in there and they do that if you claim it, that’s your problem. Mary			I went to the trade show and I get this pamphlet from this lady at the trade show. She’s got all of her soaps listed as say lavender, chamomile, will give you a relaxation being this or that, all these ingredients that she claims that means that she’s got to be licensed? Kim			In Florida, she would have to have them registered as a cosmetic. Mary			Now what do you do to get them registered. Kim			That’s another session we are going to do, not today. Elsa			However if I have some chamomile soap, it’s not on the actual bars, does that link that two together? Kim			Yes, the two are together and it’s a cosmetic. She’s says that she has lavender for calming, chamomile for calming, whatever. Elsa			A lot of people are doing that right now. Group			The hotel bars, they don’t list the ingredients. Kim			They don’t have to because they are not sold and that’s why you cannot buy those little soap bars. The hotel will not sell them to you, they can’t resell them. It’s a soap. Kim			Absolutely a claim. It doesn’t make the claim less untrue. All those claims may be true. Kevin			What if the ingredients list is actually factually incorrect. Kim			And you’ve got that on a lot of them. There quite a few of them there with an incorrect ingredient list. Did you notice there are some ingredient lists that don’t have any type of lye in it? Hard for them to argue that it’s an alkali salt or fatty acid when they don’t have an alkali as one of their ingredients, right? Kim			That’s them representing it. And the state agency is going to be responsible for proving it and if they already know that someone who heard it from you has already complained to them so they already have their witness to show that that happened. Elsa			So if it is made exclusively for a hotel then it can be a soap? Kim			No, it can be sold wholesale like that in bulk, that’s the bulk sale which is the exemption, you can sell in bulk, but they can’t resell it and they can’t sell that same item to the public, so you won’t see them selling that in their shop, on their booth. Phyllis			I think liquid soap, I didn’t see anything that disqualifies it. Kevin			That is why they have that nonvolatile thing. They are saying we’re not talking about the water, we understand that, the stuff that isn’t water, is that mostly an alkali salt or a fatty acid. Kim			Liquid soap is soap. As long as it is an alkali salt or a fatty acid,  but remember its got to be the bulk, so if you’re adding water and making it thin and adding more water, then you’ve that alkali salt or fatty acid which some people do to liquid soap. Kevin			The water doesn’t count, it is just the nonvolatile part, so you can dilute it. Question		So you can make liquid soap in Florida? Kim			Powders? Like in laundry soap? As long as you can argue that it is the alkali salt of fatty acid, it’s soap. I don’t know if you can make that into powder. Kevin			You can, but if you go to the grocery store the laundry detergent is going to be a synthetic. Kim			And your dishwashing detergents, they are all synthetic. I don’t know if you can do an alkali salt of fatty acid and turn it into powder and still have your bulk of your ingredient be alkali the salt of fatty acid. I am not a chemist, but if you figure it out how to do that, then you’ve got it. Amanda		The Psoriasis community, they have said that pine tar soap is really good for the skin and it helps people with severe psoriasis. Amana			That means if I make a pine tar soap I can say it’s good for psoriasis or no? Kim			That’s a labeling session, and no, you’re making a claim. Have you done testing? Amanda		No, but the Psoriasis Society and all of them have and they say that it is. Kim			That’s a labeling session for later that we’ll get to because there are some things you can say based upon studies. Kevin			Could you make a pine tar soap and not make any claims about it? Kim			Absolutely, you are not making a claim about it. Did everybody redo their second sheets? Yes then put your names on it. Catherine		Yes and no about the pine tar. You need to make sure it’s creosote free. Do you know what pine tar it? Amanda		I know how it’s made. Catherine		You just need to make sure that when you buy your pine tar that it is creosote free. Kim			Okay so let’s go through them. Gramma’s Pure & Natural,   She says she’s just pure soap, but if you look at her claim on the back, the dry itchy skin soap. It is probably a cosmetic claim, not a drug claim. She would be fine just by registering her product because everything seems fine, just to register her product and keep selling it as it is. It would be considered a cosmetic or drug, but not a soap. Grandpa’s – what is he missing in his ingredient list? Kim			Can’t make soap without lye can you. He has baking soda in it, but not alkaline enough to create soap. Hair & Body Therapeutics	Their soap is good for the hotels exclusively made for the hotels Comfort Suites. They don’t have to do anything. It can say that, doesn’t have to have the ingredients because they are exclusively doing it for Comfort Suites. We have to assume that’s true and you can’t buy it from them. If the government found out that they were also selling that same product, that would be a different thing but I can guarantee that they are not. It’s a soap. Phyllis			They sell it to the hotels? Kim			It’s wholesale. That is soap. That’s regulated soap in Florida. Bright Starts		Same thing for Bright Starts. Kim			It doesn’t matter. They can do that on the hotel chain soap. And if you sold the same bar of soap, you need to do it in a different size and label it correctly, just call it soap and whatever is making it energizing just list it, instead of telling them energizing, people are reading labels now and read the ingredients. They know what they want. Shea Moisture		This is a very busy label. There is a lot to look at on this label. This is probably actually not a cosmetic but a drug because of some of the stuff they say on it and I’m not saying that these aren’t legal Products in Florida, all I’m telling you is what is and isn’t soap, so they may be all legal and fine. They may be registered, so they may be all legal. Melt and Pour Honey	Have you any idea if it’s an alkali salt of fatty acids as its bulk major component? No idea, therefore, it’s going to be treated as a cosmetic. Question		And that’s okay. Is it regulated as a soap? Kim			No, they just haven’t been caught. There is a lot of stuff sold in this country that just hasn’t been caught. Kim			I don’t know if this is made in Florida or not. Kim			And that’s why some places don’t ship off to other states, certain states where they know their product doesn’t comply. Bigger companies you’ll find. M&P Clear		It’s got a little more on it, but you still don’t know what it’s made of. So if you use this to make your soap that you’re claiming is soap but all you’re doing is saying adding lavender scent and lavender buds and you think that it would be soap that you sell as soap in the market in Florida. Uh Uh. You don’t know that it is an alkali salt of fatty acids and chances are most melt and pours are not. Soapsations		Again, same thing, this is a melt and pour. This is a one lb. melt and pour. Not a soap. 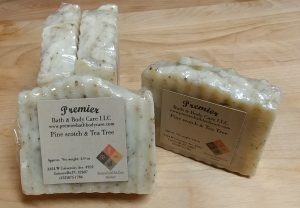 Tea Tree Therapy	Vegetable base soap with tea tree oil and lots and lots of language, busy labeling, not tested on animals; it all looks good and great, it may be registered somewhere, now what you need to know, but look at, what’s that down there? What is that down there, “TM”, that’s a trademark. They are not saying the soap is Tea Tree Therapy, it’s the name of the company. Well that’s labeling. We will get to that in another session, not for today.  .  Basically as I understand it they mix sodium with palm oil and get just that hard soap, coconut with sodium and they get that hard soap and they can mix that together. This is not a soap. Kevin			So those are names of the alkali salt of fatty acids. Kim			Yes, great way to put it. Kim			No, we are talking about the ingredients. You asked me about those and that would make it a soap, but the claims they make take it out of its being a soap and unregulated. So they put themselves into regulation. This is at least a cosmetic if not a drug, it’s made in California, so the idea is for you to understand what you need to do to yours. M & P Crafter’s Choice		That is basically soap. Sodium Cocoate is soap made with only coconut oil and sodium and water. This is an alkali soap and fatty acid like Dr. Dunn eloquently explained a couple of minutes ago, and that’s what that is. Okay the question is you’ve got some other ingredients here, propylene glycol, sodium stearate, glycerin, water, do we know what the bulk is? You’re assuming that sodium cocoate is if you said soap, but you have propylene glycol, you’ve got sodium stearate which Dr. Dunn talked about. That’s another fatty acid that is not an alkali salt. Kim			So it’s adding another bulk component. This is one I don’t know the proportions, so it’s a cosmetic, but it seems like it might not be. This one probably is, but you don’t know because you have propylene glycol in between your two ate’s as I call them, your processes, your results, so we don’t know what the most is. My assumption is that when you would add this sodium stearate to this cocoate, it is going to be bulk, but I’m not sure. Do you understand? You want to know the proportions given how those ingredients are listed, because they require to be listed as you know, the one most first, so that means propylene glycol is second most ingredient, so we would hope that this stearate added to it would keep the sodium cocoate and the sodium stearate be more than the propylene, glycerin, water, sorbitol and honey. I would like to think that but I don’t know. It doesn’t have the yellow tint, so I don’t think there is much honey in it. Kevin		It might be that the information is not on the label but they could provide it to a regulator and say these are the proportions. Kim		Right. To make this soap the most ingredient in it is sodium cocoate. The second most ingredient is propylene glycol. The third most ingredient is sodium stearate and the fourth is glycerin. I would like to think that the sodium stearate and the sodium cocoate when combined together are more than the propylene, the glycerin, the sorbitol and the honey, but I don’t know that. But then, on the web site they might tell you the proportions or percentages. They just don’t on the link. If they tell you on the web site that’s fine. They tell you on something that comes with it, that’s fine. Kevin		It might be on material safety data sheet that they send. Elsa		Where did you come from, a craft store or the internet? Kim		No I purchased it somewhere. Elsa		Okay fine, there is better stuff on the internet than the stuff you buy in the craft store is junk. Kim		Because I don’t know as an attorney, I have to say cosmetic, but I think if you just looked at their, like on their web site, they have more information or if you call them and ask they probably tell you, like Dr. Dunn says, their proportions might be on their MSDS. I’m guessing, I would be pretty confident that sodium stearate and sodium cocoate are more than the rest of the other ingredients combined. I don’t know that but I think that probably is and that would allow you to remelt it, deal with additives and still sell it as soap. Liquid Gold	What about this one? Do you have much information about this one at all? It’s at least a cosmetic, probably not a drug because there are no drug claims. We have no idea because we don’t know what’s in it. It’s not soap. Stephenson’s	Melt & Pour, it calls itself a soap base. You don’t know what it is and most of the melt and pours are synthetics. Like Dr. Dunn told you, all the detergents you go buy in the grocery stores, they are all synthetics. Susan		So did we end up with only two soaps, being the hotel, therapeutics. Kim		There was a melt and pour. Crafter’s soap as based on the label. So Susan can you tell them how you did. Can you give them the papers? It depends on what goes in it. They were supposed to do it what was on the label. What do you call those when you have “ate” at the end. I know it’s a result of the process. Dr. Dunn	What you have what? Kim		When you have a result of a process. I’m sure you call it something, is it a compound? Dr. Dunn	Those are just names for the stuff you get when you, no I don’t know that something. Susan		We just got through the list, so it will take time. Kim		Susan and Brittan are going to finish the papers and give them back to you so you can see how you did. You can see if answers significantly. Does anyone have any idea if your answers changed significantly? Kim		Good, most of you didn’t realize how basic it really is to just be soap. You can put other things in it as long as your bulk is the alkali salt of a fatty acid and your label doesn’t take you out of soap. You can list all those other ingredients as long as your labeling doesn’t take you out. You’re good to go as soap. Michelle	We were always told we could not sell liquid soap in Florida. Kim		Look at your definitions. Re-read your definition of soap. It’s that simple, it really is. All we did was to determine if it was soap or something different. We didn’t even determine what that something different was. Okay? But the law in which you were dealing with the definition dealt with cosmetics, drugs and medical drugs and the drugs are over the counter prescription drugs. There is a whole slew of Federal laws, but remember, our Florida definition of soap comes from Federal law. Remember that! It’s the same definition. So the caveats you are going to have later, the labeling, your packaging, your advertisements, all that kind of stuff, you are going to have to worry about the Fair Practices and Labeling Act. You are going to have to worry about the FDA which is where are definition of soap came from, so you are good with them for soap. You are going to have to worry about the USDA, depending upon what claims you are making. You have to worry about the FDA depending upon what claims you are making. You are going to have to worry about the Federal Trade Commission, depending upon where you’re selling it. That doesn’t change it in Florida, it’s soap and you can sell it. You are going to have to worry about the CPSC, that’s Consumer Protection and Service Commission. They are the ones that come out to Florida and inspect your label. OK, but we’ll deal with three of those agencies, I believe, when we deal with labeling. We will deal with their rules when we deal with labels, but right now you know what is soap and if it is not soap but it’s something else. But as long as you keep your label basic, you’re good. You are good to go and sell it in Florida all day long. So stay tuned, next time LABELING!